You are here: Home / History / Will you come to church with me on Sunday? Will you come to church with me on Sunday? “Will you come to church with me on Sunday” is most certainly not a blog post title I thought I would be writing this summer, or ever. Last Sunday, I attended the service that Albright United Methodist Church held on the lawn in front of their church on Centre Ave. I don’t often go to church, I am not Methodist and I had not attended a church service at Albright before. If I go to church it is to look at the architecture or I will on the rare occasion sneak in the back of East Liberty Presbyterian Church in time for the sermon. Sometimes I go to church because it feels like it is the one place where there are no cell phones or emails. So how did I get to Albright and why am I asking you to come with me? In 2012, I was asked by a good friend to help with the Community Thanksgiving Dinner at Albright. Albright has hosted a free Thanksgiving dinner for the last 40 years. I have been happy to lend a hand with the event and it is one of the nicest ways I can think of to spend Thanksgiving eves in Pittsburgh. My latest favorite photo of Albright with the stained glass illuminated. Over the past years Albright, I have worked with my friends who have been life long members of the Albright congregation and a dedicated group of volunteers to help envision a future for this grand old 109-year-old church building. 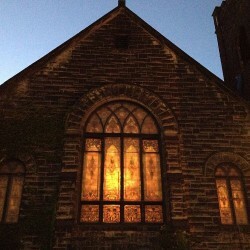 There are so many ways that this church building can not only continue to be a bright spot in the neighborhood (Albright is technically in Bloomfield, but sits across the street from Friendship & Shadyside) as a beautiful building and as a community space that is much more than just a place to worship on Sunday mornings. This summer, I have been working every weekend and many weekday evenings to help the congregation spruce up their church so they can return to worship in the sanctuary. There are still a few more things to clean up before the congregation and the community can use the building again, but we have been working very hard to show off this beautiful space to the city of Pittsburgh. Last month we hosted a community block party and had an incredible response from all over the city. You can see some photos from the block party here. 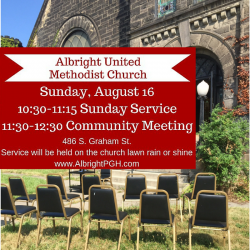 I know this is last minute, I know it is a Friday afternoon in August and many of you are at the beach or wishing you were at the beach, but if you are free this Sunday, I want to invite you to come with me to the Albright church Sunday service and to stay for the community meeting that will follow the service. If worship isn’t your thing, just come and sit with me in the back of the service (I will be sitting in the back, and I will happily save you a seat). If church isn’t your thing, that is ok too. Feel free to come just for the community meeting or stop by and drop a few dollars in the collection basket. All funds are being used to repair and restore the church so that it can continue to serve as a bright spot in the neighborhood for many more years to come.